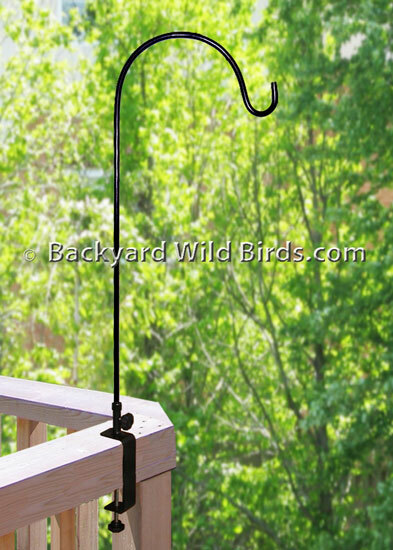 Deck Bird Feeder Pole Wide Clamp is made to hang bird feeders on a wide deck railing. 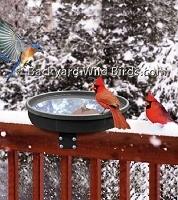 The deck bird feeder pole is a swivel shepherd staff with 12" reach and a large wide mouth clamp to secure to a deck railing wider than the 2" standard. 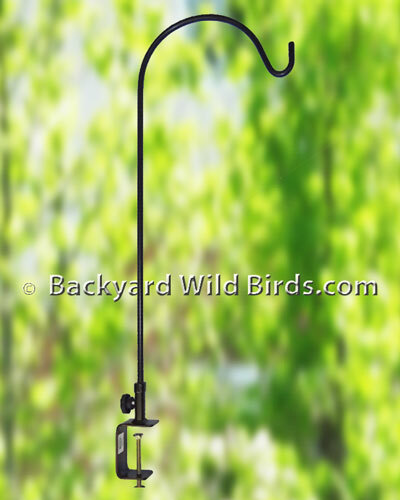 The large clamp deck bird feeder hanger arm has an overall height of 36.5 inch and a reach of 12 inches. Its hang point above the deck is 28 inches. This pole has a wide clamp fits deck railings that are from 2" to 5.5" thick. Measure your deck railing to be sure it fits within these measurements. It should be able to clamp on an open deck railing section like the side of a 4x4 shown here. The adjustable clamp knob can be tightened to hold in place. The hanger arm is made from 3/8 inch cold rolled steel rod and can swivel with an adjustable knob. The max weight handling is about 10 lbs. Bring Hummingbirds and Goldfinches right to your deck with nectar and thistle bird feeders! Note: The Wide Clamp (default) is not designed for railings thinner than 2" and would place undue stress on the thread portion. There is a Standard 2" Clamp Option below you can choose if your railing is less than the 2" wide.